Now you can capture and share the world just as you experience it. 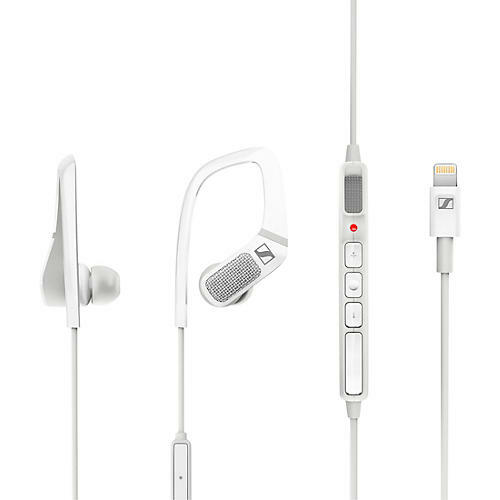 The earpieces are fitted with high-quality microphones, letting you create videos with stunning 3D sound on your iOS device. Connect AMBEO SMART HEADSET directly to the Lightning port on your iPhone, hook each earpiece around your ears and listen to your music or videos with stunning quality – no setup, charging or pairing required. The earpieces are fitted with professional quality omnidirectional microphones for binaural recording that captures the sounds of your environment in 3D, just like your ears hear them. These microphones also enable the Transparent Hearing and Noise Cancellation features that allow you to blend the sounds of your surroundings with your music or tune them out. With a special dedicated app you can program the Smart Slider of your AMBEO SMART HEADSET with various functions (default function is mic sensitivity control), adapting it to your individual requirements. Control Advanced Settings with Free iOS App Use the AMBEO SMART HEADSET App to access advanced features and customization options. Control your input level for 3D recording, toggle between EQ presets or configure your Transparent hearing settings. Customize the Smart Slider for an array of functions, from quickly launching your favorite audio or video recording app to toggling the Interact Mode to communicate with those around you. Voice Prompts are enabled by default for an audible confirmation of any changes you make via the controls on AMBEO SMART HEADSET, however this can be disabled from the App if desired. The App is available for free from the App Store, but is not required for normal operation of AMBEO SMART HEADSET.